Safety is the basic ingredient for urban prosperity. The costs of violence on a city are incalculable – both the real and perceived safety of the city of Louisville affects all citizens and the businesses that support our economy. 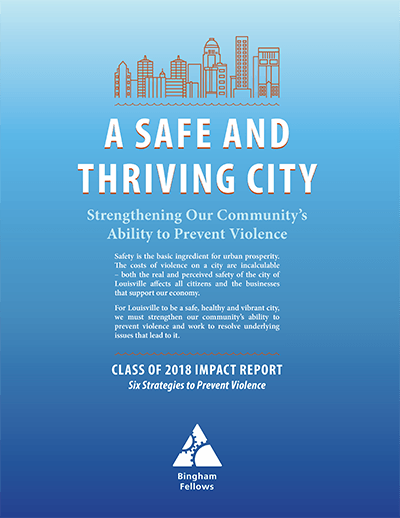 For Louisville to be a safe, healthy and vibrant city, we must strengthen our community’s ability to prevent violence and work to resolve underlying issues that lead to it. 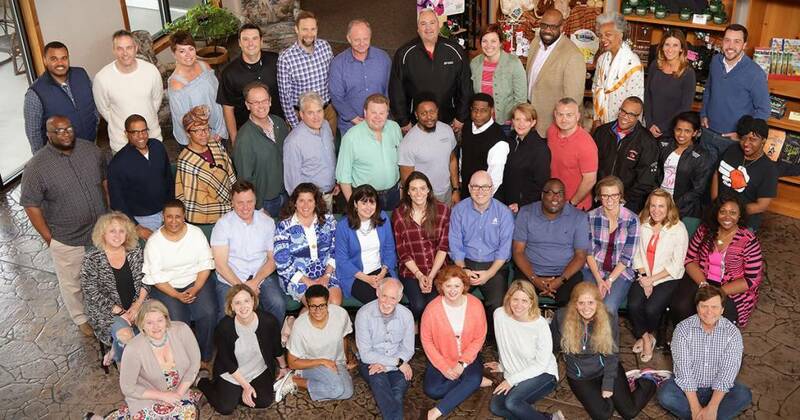 The 41 community leaders who came together as the Bingham Fellows Class of 2018 brought diverse backgrounds, occupations, and experiences. We spent one year creating the conditions for collective action, leading to a safer and more prosperous future for us all. Our class includes passionate and dedicated problem solvers from public agencies, private corporations, and social service organizations. We bring expertise in education, finance, law, public safety, economic development, and community organizing. Through the Bingham Fellows program, we all gained further appreciation for the urgency and depth of the challenge we have in addressing the social and economic root causes of violence in our city. We understand violence is influenced by a complex interplay between individual, relationship, community, and societal factors. Therefore, to prevent violence it is necessary to act across all of these levels. Like the tip of an iceberg, violence is what you see. The causes are much deeper. To prevent violence, there’s not one simple solution. We must act at all levels to address the range of factors that put people at risk for violence or protect them from experiencing or perpetrating violence. 1. Our projects begin by positively influencing events happening now. These are prevention strategies in schools and neighborhoods that address the social and physical environments that are associated with becoming victims or perpetrators of violence. 2. We also will focus on change at the systems and structural level. These strategies better support youth and adults involved in the criminal justice system and overall public policies that perpetuate structural violence. 3. Social and cultural norms help create a climate in which violence is encouraged or inhibited and help maintain inequalities between groups in society. 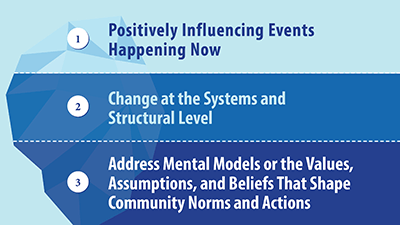 We’ve developed strategies that seek to address mental models or the assumptions and beliefs that shape our community norms and actions, specifically around Louisville neighborhoods. Partnering to Cure Violence (P2CV) will introduce a collaboration between Jefferson County Public Schools (JCPS)and Cure Violence – an initiative of Louisville Metro’s Office for Safe and Healthy Neighborhoods – to use the nationally recognized Cure Violence model to interrupt potential violence in the youth population. The partnership will be multi-faceted. Initially, P2CV will implement extended training for JCPS educators in Trauma-Informed Care, the Cure Violence model, and youth empowerment. Additionally, the partnership will include placement of interrupters –mentors trained in the Cure Violence model who can talk to students about alternatives to violence – in select middle school and high school locations on a part-time basis. Finally, P2CV will introduce placement of mental health practitioners designated to serve JCPS youth at selected sites in Louisville. The goals of the project are to reduce violence in Louisville, better support at-risk youth, investigate alternatives to suspension and exclusion for students who are likely also victims of trauma/abuse, and allow students potential escapes from violence. Ultimately, P2CV will save lives and make Louisville a safer and more thriving community. A critical number of West End residents are unemployed or underemployed due to transportation problems. Too many employers have unfilled jobs because good workers can’t get to them. The Driving Success mission is simple: help West End residents get to work. Why transportation and jobs? Because a city with plenty of secure employment builds wealth and security, thus reducing crime and violence. Driving Success is working with Russell: A Place of Promise, a new economic and community empowerment initiative, to connect west Louisville residents with good jobs through reliable, multi-modal transportation. Through Russell: A Place of Promise, public and private-sector transportation providers, such as TARC and Yellow Cab, are connecting with businesses in RiverPort and other area employers, including Passport Health Plan and Evolent Health. Pilot projects are underway. We expect to measure success by the number of unemployed or underemployed people who get and hold good jobs as a result of a reliable transportation network. Should the pilot projects prove successful, Russell: A Place of Promise will incorporate a full-time transportation coordinator/broker who will help the network grow and thrive. The Opportunity Network was created to bring system decision makers together with users and providers of services and supports to improve outcomes and remove barriers to successful reentry for justice-involved youth and adults. Our mission is to address policy and practice gaps in order to create a healthy, thriving community that prevents and reduces recidivism. The Opportunity Network will drive changes in practice, policy and legislation at the local and state level, leveraging its partnerships to do so. 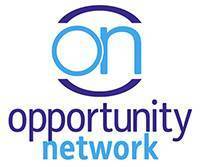 The Opportunity Network is made up of 22 volunteer members. Those volunteers represent the system itself, have served time in the system, or provide support and service to those involved in the system. With private fundraising, in partnership with The Community Foundation, the Opportunity Network will employ one staff member. The Network will operate as a workgroup of the Louisville Metro Criminal Justice Commission. The Network begins a three-year pilot period beginning in January 2019 and will test the concept of coordinated, dedicated efforts to system improvement. The pilot is occurring in Jefferson County to test the viability of such a network for local communities across the Commonwealth. Our plan is to incubate CPCI within a local organization doing work that aligns with the work done through the center. After the initial incubation of the project, the goal for the project is for it to be co-owned. CPCI will work to elevate the importance of policy and the role it plays in shaping humanity. Ensuring equitable ownership among stakeholders is imperative. Co-ownership mitigates power differentials that might exist among stakeholders, and it also increases the likelihood partners will contribute more of their respective organizational resources that support the Center’s shared mission. Any Louisvillian knows, almost instinctively, the boundary line between the West End and the rest of Louisville: Ninth Street. The notion the West End is a dangerous place is embedded in the mental models many of us carry around in our heads. UJIMA, the third principle of Kwanzaa, reminds us we all have an obligation to the past, present, and future – that change results from collective work and responsibility. Currently, there is positive buzz related to social and economic development in West Louisville. The UJIMA Experience builds on this existing momentum by exposing positive West End assets to ALL Louisvillians. Amend, from the Latin emendare – meaning to correct, free from fault. As we seek to build a safe and thriving city, one known for its compassion, we will work to address the lack of understanding that prohibits true social and transformative change. Our goal is to broaden awareness and understanding of social, political, and economic constructs that stand in the way of progress. Structural violence is harm caused by social structures and social institutions that prevents humans from meeting their basic needs. Racism and classism are examples of structural violence, and these elements are challenging to resolve since they are rooted in often unconscious cultural norms woven into the fabric of our society. Many are unaware these social constructs exist. They are even difficult to acknowledge because they oppress certain groups of people. These false narratives perpetuate barriers and continue to marginalize people and communities.